News from Berlin - During the weekend of May 9th until May 12th, famous Russian musical singer Ivan Ozhogin paid a visit to Berlin. 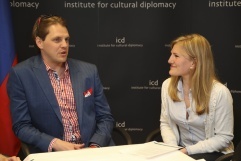 On Friday evening he was a guest at the Institute for Cultural Diplomacy where he gave a short but interesting interview. Mr Ozhogin stated that he considers himself a “Cultural Ambassador”. After all, his repertoire spans multiple genres from multiple countries, and he hopes that his music will bring together people from different parts of the world. 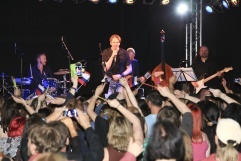 This hope seems to be well-founded, as his Saturday concert at the Frannz Club showed. A vibrant crowd consisting of people from all kinds of countries, most of them female and clearly avid fans, queued up in front of the club an hour before the show began. For an hour and a half, Mr Ozhogin and his band entertained the crowd with a mix of musical songs and pop songs in a variety of languages including Dutch and Ukrainian. The Sunday concert at the Russisches Haus was a more Russian affair in honor of Victory Day, the day that Russians liberated Berlin from the Nazi’s in 1945. 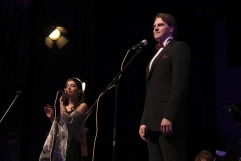 Ivan had invited several guest stars: Mercedesz Csampai lent her voice and Aydar Gaynullin her impressive accordeon talents, while Elena Bulanova and Petr Iljasch took care of the piano and violin, respectively. In all, Mr Ozhogin’s visit to Berlin was a success. The full interview with Mr Ozhogin, as well as a recording of the concerts will be available on our YouTube channel soon.